Are you signed up for Bernard LaFayette's packed-with-inside-information MOOC? Here are the topics for the first week. We will meet Sunday the 31st at 12:30 to discuss them. Well, some of them (we only have an hour). Kirkus Review calls Mother Bruce "Visually beautiful, clever, edgy, and very funny." Update (Thursday the 28th): Open today at 11:30. Normally we open at 10 on Thurs. but the City has a delayed opening. Update (Wednesday the 27th): Open today at noon. At last! We were closed 5 days. No fines will be charged for that interval. Update (Tuesday the 26th): Closed today. We expect to be open tomorrow, the 27th. We have canceled the morning baby program, but not the author visit Wednesday evening. We are closed now (Friday the 22nd) and will remain closed through Sunday. Monday? Check first. Current information. New MOOC! Jan 31st - Feb 28th we will gather on Sundays to discuss the online course directed by Dr. Bernard LaFayette, Jr., a veteran leader of the civil rights struggles of the 60s. 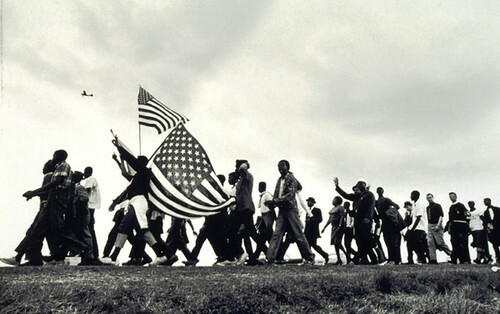 From Freedom Rides to Ferguson: Narratives of Nonviolence in the American Civil Rights Movement will be hosted by Emory University where Dr. LaFayette is now a Distinguished Scholar-in-Residence at the Candler School of Theology. You need to first get a Coursera account (free) if you don't already have one, and then sign up for the class. If you plan to come on some of the Sundays for coffee and talk, please let us know. The short videos this week look at ways in which Germany has been re-interpreting and re-imagining their WWI heroes. Das wei�e Band - Eine deutsche Kindergeschichte (2009) Not so jolly. Post your own short, informal review of a current book or film about WWI. (Short means short - max 250 words.) We included a booklist in our post last week. Then a final exam. Optional. The bad news - almost nothing entered public domain in the United States on January 1. The good news - the New York Public Library has digitized almost 187 thousand items in their collections. ps — Don't miss the wonderful things they have done with menus. This is a reminder that the second meeting on Library renovation and possible expansion will take place this evening - Thursday, January 7 at 7:30 p.m. in the Azalea Room. Greg Lukmire of The Lukmire Partnership will present the most recent concept design, which incorporates recommendations of the City Council, and Library and other City staff, as well as public comment. All are invited to attend this discussion ! Be a Friend and show your support for Library renovation! We won't hold Sunday sessions for the WW1 Heroism MOOC in January, though we might do so later during one of the repeats. This week's portion has two parts. part 1 - Tracking changes in sentiment through poster design. Short videos and then you are launched right out into your own analysis. The assignment: choose a poster, pin it on the course board with a few comments. Reminder: you are auditing. You do not have to do these assignments. You can just watch the videos and stroll through images. part 2 - Paintings. Again, short lectures then you are off to tag and comment. You can discover other sources online, even within online forums. The assignment: get a free BBC account then curate and annotate a small collection of WWI paintings at their Your Paintings site. If you are doing the assignments, for the second week you will have an opportunity to write a review of a recent book, film, or TV show about the First World War. Has our concept of heroism changed? Here is a selection of recent books in our library. If you have read any of them please go into our catalog to tag and comment. Other choices? Search our catalog for the subject: World War, 1914-1918. We have 171 books with that tracing. We don't have films or television shows in our library. But you know how to find them.